It’s pool party season again and no other city does it quite like Las Vegas. If there ever was a reason to host a bachelor party or girls getaway in peak Vegas summer, then epic pool party is it. With most pools now open for the season, here are 5 of our absolute favorite hotel pools to check out this summer. Some of these hotels even offer specials or complimentary passes when you book a suite – check with a concierge for current pool promotions in Las Vegas. The Cosmopolitan of Las Vegas is the epitome of trendy and worldly. Host to a vibrant nightclub scene that’s supported by a casino and pool-side parties at the Marquee Nightclub & Dayclub, The Marquee features 22,000 square-feet of entertainment with two pools, a gaming area, and several bars. Opt for an exclusive experience in one of the Marquee’s grand cabanas which feature dedicated food and cocktail service, infinity-edge dipping pools and flat-screen televisions. The Cosmopolitan of Las Vegas also offers access to world-class dining options thanks to restauranters like José André, The One Group, and David Myers. For groups that want to focus on adult fun, head to the pool party at Wet Republic at the renowned MGM Grand in Las Vegas. 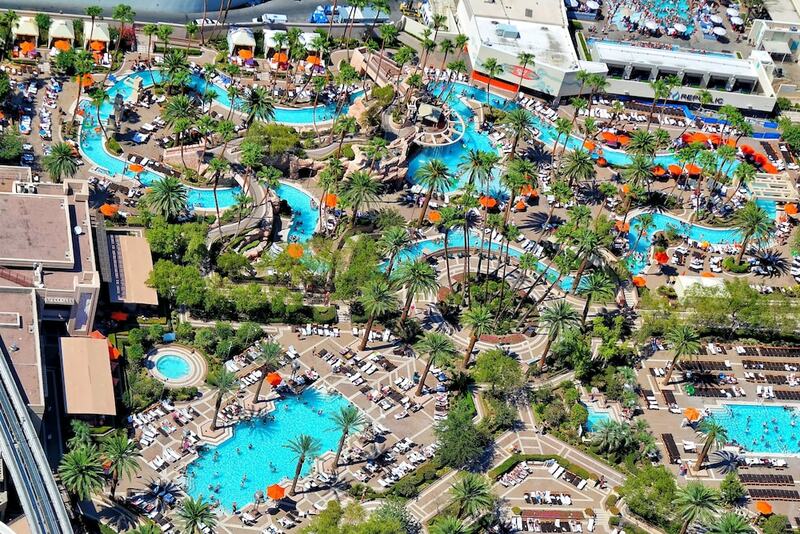 Located in the heart of the city’s famous Strip, Wet Republic spans six acres and is packed with features like five different pools including an adults-only pool, a lazy river, and a party pool. An oversized open-air lounge invites partying while the giant LED wall near the DJ booth features dedicated performers. Numerous bars are scattered throughout the hotel complex which also boasts nearly two dozen restaurants and a casino. If your group wants a large dash of Italian elegance and culture along with its pool party, head to Tao Beach at The Venetian Resort Hotel & Casino. Seven days a week from March through October, your pool partying friends can enjoy an exotic Balinese escape in the city’s most iconic hotel. Often frequented by A-list celebrities and hosted by world-class entertainers, open format DJs turn Tao Beach into the ultimate dance and pool party every Thursday, Friday and Saturday night, making it a great place to people watch while you down mouth-watering delights and cocktails. At the Encore Beach Club at Encore at Wynn Las Vegas, you’ll find the youthful and hip culture, the lush foliage and its prime location on the strip to be exactly what your pool party dreams are made of. Restaurants and bars line the large pool with tropical palm trees swaying in the warm Las Vegas breezes. Having everything within an arm’s reach makes it easy to sip and nibble during the festivities. A full lineup of nationally-known musical acts and other performers ensures that you’ll be musically entertained the whole time you’re there. Drai’s Beachclub and Nightclub offers 65,000 luxurious square feet of entertainment with live acts and DJs. Situated at The Cromwell, a Las Vegas hotel focused on providing its guests with an experience that’s unique in the city, Drai’s Beach Club and Nightclub is the creation of Victor Drai, known for his visionary concepts in hospitality and nightlife. Set atop The Cromwell’s roof, Drai’s Beach Club rises 11 stories into the sky, giving party-goers unprecedented views of the Las Vegas skyline and sights. LED lighting, a luxe design, and modern technology systems fuse with the latest DJ talents to provide entertainment to party guests throughout the indoor and outdoor spaces. Drai’s Beach Club spans 35,000 square feet and has the capacity to hold 2,500 pool partiers.